Despite the recession, continued financing difficulties and a glut of condominiums, demolitions continue unabated in East Village. In the span of two weeks, three unique buildings have been lost forever, each for a different reason, all with the same result: a vacant lot that forever breaks the continuity of the past with the present. 1546 W. Augusta was a truly striking building: a gorgeous prototypical East Village red-brick two-flat complete with its original cornice, porch and windows. What vintage building owner doesn’t wish theirs still had these original features intact? 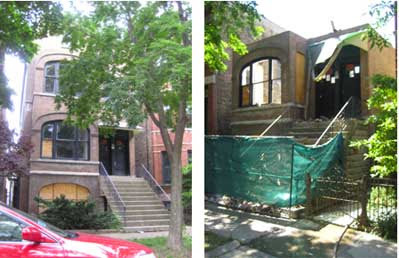 This lovely building is the latest victim of Ald. Walter Burnett’s methodical spot upzoning of the area east of Ashland Avenue. This portion of East Village was downzoned to R-3 by former Ald. Jesse Granato more than a decade ago. The zoning change helped buildings like this one survive the recent development boom because they offered an important advantage over new construction. They were larger than the new structures that might replace them could be under the new zoning classification. Unfortunately, Ald. Burnett sealed the fate of 1546 W. Augusta by increasing the zoning an egregious three classifications to RM4.5. Density is a highly desirable goal in our urban environment, and one that should be encouraged, but it is not the issue here. The new building will not be any larger than its predecessor; it will simply provide three units where two existed before. This will add to the glut of unwanted small condominiums and reduce the number of units that available for families, ultimately contributing to a more transient population. The real irony is that the new building will be constructed under the Chicago Green Permit program. Nothing could be less "green" than tearing down a perfectly serviceable structure. 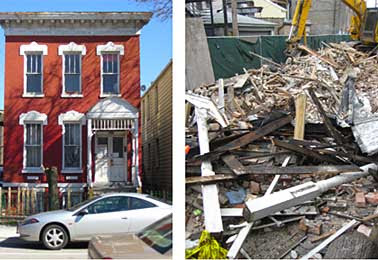 It is widely recognized among building professionals and sustainability experts that even the most energy efficient new construction may never offset the embodied energy lost in demolition. Using the Teardown Calculator at www.thegreenestbuilding.org, I estimated that the energy lost in just this one demolition is 6,248,400,000 BTUs, or about what it would take to heat an average-size apartment for more than 200 years. One step forward, two steps back. 920 N. Winchester represents the polar opposite situation. With no desire to sell or develop his property, absentee owner Vujovic Petkovic was content to simply allow it to deteriorate. He refused to secure the building and allowed it to become a nuisance. Some neighbors, having lost their patience with Petkovic, demanded that Ald. Scott Waguespack force the building into demolition. I do not want to diminish the plight of the neighbors because this was a difficult problem, but demolition was not the proper answer. Destruction of a sound vintage building should never be an option for solving the short-term problems caused by a particular owner. East Village has endured several cycles of decline; if we had torn down every building that at some point had a neglectful owner, nothing would be left. This building served its community for a century and could have continued to do so in perpetuity with proper care. The fact that it was not currently receiving that care does not negate its value or long-term potential. But its loss has precluded its eventual return to proper care and service. The vintage East Village building stock is among the highest quality in the city. Its locally fired brick, old-growth wood framing and high-quality design never will be seen again, and certainly not in what would likely replace this building now that it is gone (particularly if Petkovic was to rebuild). Our vintage buildings are resilient and highly resistant to neglect, though they may appear decrepit. As with 1546 W. Augusta, the materials and embodied energy stored within a structure like 920 N. Winchester are a valuable resource made all the more precious by the current scarcity of such materials and growing concern for the environment. Ultimately, the neighbors clamoring for demolition got what they asked for. Only time will tell if a trash-strewn vacant lot is better than a neglected building. All of us are the worse for the loss of this classic building, except Petkovic. His property, taxed at a ridiculous $2,500 per year, can now be reassessed lower as vacant land. 1726 W. Augusta was a typical three-story common brick structure with a gabled roof, modified perhaps in the 1930s with a yellow brick facade. At the rear of the lot stood a fascinating gable-roofed coach house, a unique structure that would not be built under current zoning codes. This building was no landmark, but even vacant it played an important supporting role as the authentic infill between more important buildings. In our debates over which buildings to preserve, we often lose sight of the role these "background" buildings play in setting the stage for the drama of true landmarks. I am not arguing that every building be preserved; there are legitimate reasons to replace buildings, even at the loss of significant embodied energy. What is troubling about this demolition is that no permit application for a new structure has yet been filed. Despite the rush to demolition, it this property will probably remain a vacant lot for a very long time. When construction does resume, I hope that what is built favors community over individuality. Urban landscapes once were ruled by a self-imposed civility in which important buildings deferred to each other. Now even insignificant buildings vie for our attention. Too often developers build as if theirs was the only building on the block, and architects (on the rare occasion when one is involved) draw as if each were the only building they will ever have the opportunity to design. What do we lose when we lose buildings like these? Buildings connect us to the long-forgotten people who built this place and lived, laughed, loved and died here before us. Our predecessors are gone, and when their buildings disappear, this place becomes just like any other: anonymous, unanchored and drifting. When we lose what makes our community unique, we face oblivion just like our forgotten predecessors. The excellent design, material quality and physical integrity of these buildings make the loss ever more tragic. The very fabric of our neighborhood has been diminished. Scott A. Rappe chairs EVA’s Planning, Preservation and Development committee. The opinions in this article are his own. Thanks for posting this, Scott. 1546 W Augusta was definitely a loss. I actually have a related question as to how one gets a building condemned. I live next door to 1947 W Chicago, which was "converted" to condominiums a while ago, but it appears that the whole thing was a scam. In fact, the building was recently named in a mortgage scam, and the whole thing looks like it's about to implode. From what I can see in the windows, the buildout was never completed and water damage has made it improbably that it ever will be. Any advice? Should I talk to the alderman? It's a breeding ground for vermin, and is pretty much a total loss. I do not in any way want to diminish your valid concerns regarding the building, but the point of my article is that demolition is not an appropriate response to troubled buildings. Sorry about that -- definitely an overreaction on my part. I happened to run into the manager/caretaker of that building today and it sounds like they're actively trying to sell it for a rehab, which makes me much happier. It just appeared to have been completely abandoned.